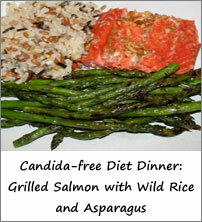 Get more recipes and Candida free diet ideas with your Candida E-course! defense helping you offset the debilitating Candida symptoms without ever experiencing hunger. Have you regularly suffered from Candida Albicans symptoms? Then, this anti Candida diet will help you end headaches, physical and mental fatigue, poor concentration, mood swings, comfort food cravings, weight loss resistance, chronic acidity and intestinal gas, recurrent skin problems – all of which could be serious symptoms of Candida overgrowth. That’s when the Candida free diet becomes a must and the Candida diet recipes come in handy. And if you’re put off by the thought of missing comfort foods while on a Candida defense diet, think again. An anti Candida diet doesn’t have to be a tasteless, difficult one. Plus, the end result is sure to be worth it… Think of all the weight you will lose with little effort… imagine your high energy and vitality, the juice back in your life! Before trying out these sample menus, you may want to review the essential Candida diet guidelines to understand the full anti Candida defense protocol and make sure you follow the step-by-step instructions for eliminating the yeast overgrowth permanently. a whey protein shake with unsweetened almond milk, coconut oil and ground flax seeds (see alternate breakfast above for recipe). As you can see, it’s actually not difficult to eliminate the foods that cause Candida and still eat delicious, fulfilling meals on your anti Candida diet. 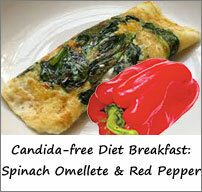 Cheated on the Candida diet and need additional Candida defense support? Consider using Candidate – your secret aid on a Candida yeast diet. Candidate is a safe herbal remedy, your natural Candida defense solution for occasional cheats, providing additional support in keeping your body at healthy levels of pH and probiotic growth. 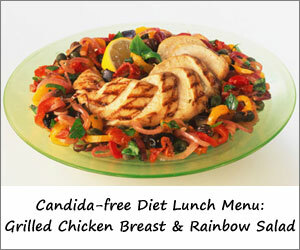 Want More Candida Free Diet Ideas and Tips on the Candida Defense Protocol?